Obviously Phil Lord and Chris Miller, “Solo’s” initial directors, didn’t heed that advice, and so they jumped ship and Ron Howard came aboard, who’s as reliable and capable as they come, though hardly as “interesting” as the “21 Jump Street” and “LEGO Movie” duo. “Solo” is consequently a reliable “Star Wars” movie that does right by fans and checks all the boxes of a blockbuster of its pedigree. Han Solo is a classic seat-of-his-pants hero who embodied “coolness” for an entire generation, so telling his backstory made sense even if filling Harrison Ford’s boots would be a huge challenge for a new actor. Alden Ehrenreich was clearly asked to take on as much of Ford’s affect as possible rather than tap into his own charisma and watching him try to do his best impression becomes a little bit of a preoccupation throughout the film. That said, there are a handful of moments when he nails a smirk or a line and it feels like we’re watching the same character, not a new actor. Any gripes with the new Han Solo should not be placed at Ehrenreich’s feet but that of the writers. Longtime “Star Wars” writer Lawrence Kasdan and son Jonathan craft many fun moments with catharsis for fans, but what one would presume to be the core of the film – the story of how Solo became Solo – gets lost in the finished product. Ehrenreich’s Solo is cocksure and optimistic. When we meet him at the beginning of the film he is a teenage thief for crime boss Lady Proxima on Corellia, dreaming of escape with his girlfriend, Qi’ra (Emilia Clarke). When the two make a run for those dreams, they’re separated, and Solo ends up with a band of professional thieves led by Beckett (Woody Harrelson). As he goes down this path, he retains this sense of optimism, which – knowing what we know about Solo in “Star Wars Episode IV: A New Hope,” means something will lead him to become Ford’s grumpier and standoffish Solo of the original trilogy. But that arc trails off in “Solo” despite the film’s many pluses. Another way of putting it: As Lucasfilm tried to make an exciting “Star Wars” movie, they forgot to make it hinge more on its title character. Beckett, Qi’ra, “young” Chewbacca (Joonas Suotamo), young Lando Calrissian (Donald Glover) L3-37 (Pheobe Waller-Bridge), villain Dryden Vos (Paul Bettany), Enfys Nest – they’re all colorful and compelling supporting characters, the kind “Star Wars” is known for, capturing our imagination, but pushing Solo out of the limelight. Odds are this was incidental, but the combination of getting those characters right and the lack of clarity around Solo’s character make it stand out. “Solo” also seems preoccupied with showing fans how things came to be: how Han met Chewbacca, how exactly Han acquired the Millennium Falcon from Lando, how Han did the Kessel run in less than 12 parsecs – even how he got the name Han Solo. Sometimes it’s just a scene, sometimes the plot bends entirely to that purpose. The success rate varies, but the explanations that do work really work. 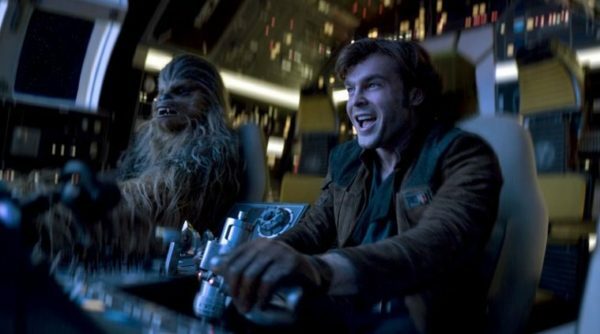 The Han-Chewie dynamic, to name a positive, is one of the biggest strengths. 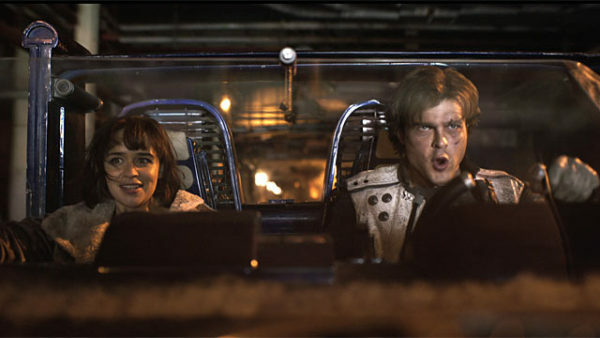 As a blockbuster, “Solo” never gets boring and stays a step ahead of its audience in terms of plot. The action all works, especially the train heist sequence toward the beginning. 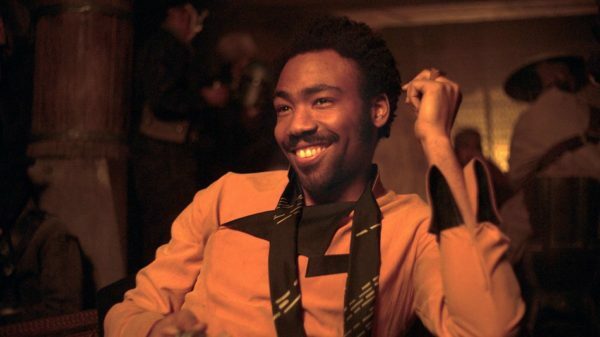 As Lucasfilm has done well all along in this new era of “Star Wars,” the look, feel and tone of “Solo” jives with everything else “Star Wars.” It’s a safe and dependable course of action for Lucasfilm and Disney to take, but spinoffs should be a little more daring, or at least give fans a chance to connect at an even deeper level with a beloved character. “Solo” mostly uses Han as a springboard into another fun but familiar “Star Wars” chapter.